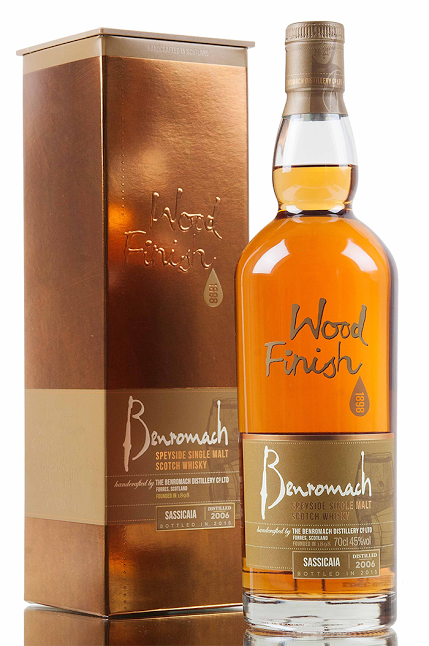 Benromach is a Speyside distillery founded by Duncan McCallum and F.W. Brickman in 1898 and currently owned and run by Gordon and Macphail of Elgin. It is situated near Forres in Morayshire and is fed with spring water from the Chapelton Springs in the Romach Hills beside Forres. This has been matured in a Sassacaia barrel, so an introduction to the wood is in order! The Sassicaia estate is located at Bolgheri and lies in the Province of Livorno in Tuscany, Italy. This is a 2006 distilled expression and bottled this year – there’s an older 2005 release, a 2004 release and a few older bottlings. All I can find out is that it’s put in an ex bourbon barrel for around 7 years, and then put in a Sassacaia barrel for around 29 months – just over 2 years. Nose: It’s got a real soft nose – dry toasted oak, vanilla, fruity, toffee, nutmeg, and that definitive wine note. Now to stick it in my mouth! Palate: Cherries, raspberries & vanilla, spices, subtle smoke, malty toffee, and wine! Finish: A medium-long finish with hints of fruit and another whiff of smoke. A bloody fine whisky to add to any collection! I love Benromach and the 10 yr is a favourite. I’ve been looking at this one at my local whisky shop but wasn’t sure. It sounds from you notes that this should become a must purchase. Looks like the Xmas list is getting another malt added to it. It’s a nice one – moreso because of the gloriously sunny day I sampled it on. It’s funny, in a way that a storm may enhance the enjoyment of a peated cask strength, sunny weather seems to be the perfect time to taste this one! Maybe you’ll have to factor an Aussie leg into your world-whisky tour to enjoy some sunshine! I know what you mean about the weather. It’s strange to how whiskies are better enjoyed in the a certain weather conditions. As for the Aussie leg of the world tour I’ve got part of one planned out, tips on which distilleries are worth the visit would be appreciated. If you’re in Sydney check out Archie Rose, Melbourne: New World Distillery but the true highlight’s gotta be my own little state. Down Hobart way you’ll find Lark, Sullivan’s Cove and Overeem. Further north in the tiny town of Kempton is Redlands and Belgrove. And I’m slightly biased as I live in the town, but Hellyers Road in Burnie is worth a visit! Ha ha, you’ve got me started on a topic I’m rather passionate about.Iit’s probably worth checking out Brett’s Tas whisky tours: https://whiskywaffle.com/2015/04/18/tasmanian-whisky-tours-a-story-worth-telling/ That way you don’t have to drive! I’ve had a look and it’s made want to book a trip straight away, I’ll have to sweet talk the wife I promised her we’d go to New York first. Also I’ve been talking to my local whisky shop about some whiskies from Australia, to be honest with it being this close to Xmas most are out of my range (in excess of £100 a bottle for Overeem and £80+ for Hellyers). They have got a new one in that they’ve not had for long, its called Starward New World malt whisky. Have you heard of it and if so is it worth picking up. It’s at a price that I could possible pick it up this week if it’s worth it. If not I’ll wait and pick one of the others after Xmas. Ha ha, I’m glad you’re keen! I am equally so! Yeah, sadly whisky here does get rather expensive as the government pockets large swathes of the profits through alcohol tax. I’m actually surprised you can get Overeem at all – it’s usually sold out before it’s even in a bottle! The Hellyers is usually A$80 here so save your money there. The Starward is made by the New World Distillery peeps in Melbourne. And I like it. Though I regard it as Australia’s answer to a quaffing scotch. Easy drinking and affordable. It’s matured in apera barrels (Australian sherry) and is a little on the sweet side. It is, however, a good example of the stuff made in Australia. I’ve posted a bit about Starward here: https://whiskywaffle.com/2015/07/07/starward-single-malt/ and here: https://whiskywaffle.com/2015/07/14/navigating-to-the-new-world-distillery-meet-the-purveyors-of-starward/ if you wanted to find out more. Thanks Nick, I’ve told my local store to put one to one side and I’ll be picking it up this weekend. After reading you posts it just sold me on it, I’m after tasting whiskies from around the world that are out to carve their own path. This sounds just right to me, looking forward to sampling it I’ll let you know how I get on. I feel your pain. And yeah, with Benromach there are almost too many good options to pick just one. I’d love to stumble upon a bar with a few of them in stock to work out which one I like best. Ooh! Now that WOULD be fun! Found a great new watering hole in Singapore this trip – Flagship. Owner is rather generous in letting you try practically anything – just a small shot but was a terrific way to wander through a range of whiskies before settling on a choice dram. That sounds like the sort of place I would like to visit. If I ever find myself in Singapore….